So you’ve taken some photos of the family but when you look at them you see that you’ve accidentally highlighted granny’s wrinkles, Aunty Bertha’s skin is as shiny as a ripe tomato, Cousin Alfred’s still suffering from acne and Sister Annie is still looking pale from the effects of too many sweet sherries the night before. No problem. Load up Portrait Professional 15 and within a matter of minutes granny’s wrinkles are smoothed away, Aunty Bertha’s skin is given muted satin-like sheen, Cousin Alfred’s pimples disappear and Sister Annie’s pale flesh is brightened up with a dab of blusher and lipstick. Of course, this software isn’t limited for use with your home photos. If you happen to be designing a fashion magazine cover and the photographer’s model is looking a little less than perfect, you could either spend a few hours tweaking the photo pixel by pixel in PhotoShop or you could let Portrait Professional automate the process in a fraction of the time. This is how it works. You start by loading up a photo. Portrait Professional takes a few seconds to identify the face and draw lines over the principal elements – eyes, eyebrows, nose, lips, chin. Now you click a button to tell the program to treat this face as a male or female, adult or child. It applies some standard enhancements to the photo and shows the original in one half of the screen and the enhanced image in the other. If the standard enhancement looks OK, that’s it – you can save the new image to disk as JPG, TIFF or PNG file. But the chances are that you’ll want to make a few adjustments to optimise the image processing first. If the image elements were not perfectly identified you can drag the lines to reshape the eyes, chin and so on. Then again, maybe the standard options don’t make your model look glamorous enough. You can apply a different set of parameters just by picking a different ‘preset’ from a panel – ‘Female Glamorous’, for instance, may make a few more adjustments to the shape and proportions of the face than ‘Female Standard’. There are presets for women and men, girls and boys. And if that still doesn’t give quite the effect you are searching for, you can go on to set individual parameters one by one, using a set of ‘portrait improving’ sliders which give you a finer level of control over things such as the amount of skin smoothing, how wide the eyes are (are they fully open or partially shut? ), how plump the lips are and so on. Using these controls you can substantially change the appearance of a face and you may need to exercise some self-control. After all, you probably still want Cousin Alfred to be able to recognise Aunty Bertha! Smooth out too many wrinkles, narrow the nose too much, make the neck too long and add a bit too much blusher and she might not even recognise herself! The plain truth of the matter is that Portrait Professional lets you make adjustments that range from the subtle to the grotesque. Most of the time, you will probably aiming for the subtle end of the spectrum but, ultimately, the choice is yours. The changes you can make can either be very subtle or (as here) fairly bold. In the processed image, on the right, not only has the skin been toned and reflections softened, but I’ve even changed the colour of the lipstick and added some eyeshadow and blusher! I last reviewed Portrait Professional (version 11) over two years ago (read my review here http://www.bitwisemag.com/2/Portrait-Professional-11.html). 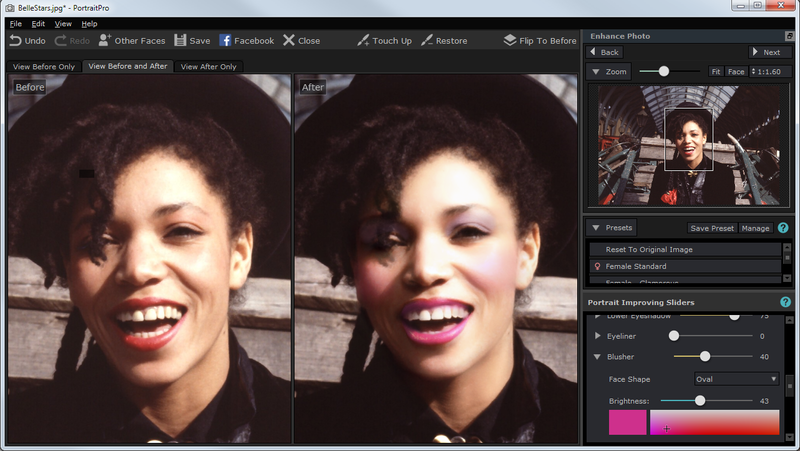 The latest version of the software has been improved by a number of additions, such as the ability to add digital ‘makeup’ and finer control over skin colouring. It comes in three editions – Standard, Studio and Studio Max (I reviewed Studio Max) and the Studio and Max versions can both be used either in standalone mode or as a plugin for PhotoShop (including PhotoShop Elements), Aperture and Lightroom. You can find the full feature lists of these editions here: http://www.portraitprofessional.com/editions/ . This is a great program that really makes light work of doing everything from removing small imperfections and skin blemishes to transforming rather mundane portraits into magazine-ready ‘glamour’ shots. The three editions are priced at £59.90, £99.95 and £199.90 respectively. However, there are fairly often discounted offers so you may want to check if there are any special deals available on the developers’ web site. Learn to Program Java - The Easy Way!